Luxury villa, 3 bedrooms, 3.5 bathrooms, just one minute walk to the sandy beach. High end villa with large terrace, tropical garden. I complete Decorated in Spanish decoration; 2 kitchens with stainless steel appliances, laundry facilities, Internet, cable TV. Each room is equipped with TV, air conditioning. The house is very private and secluded by a high wall; High tropical vegetation add to privacy. House is close to supermarkets and the center of Sosua with its nightlife. 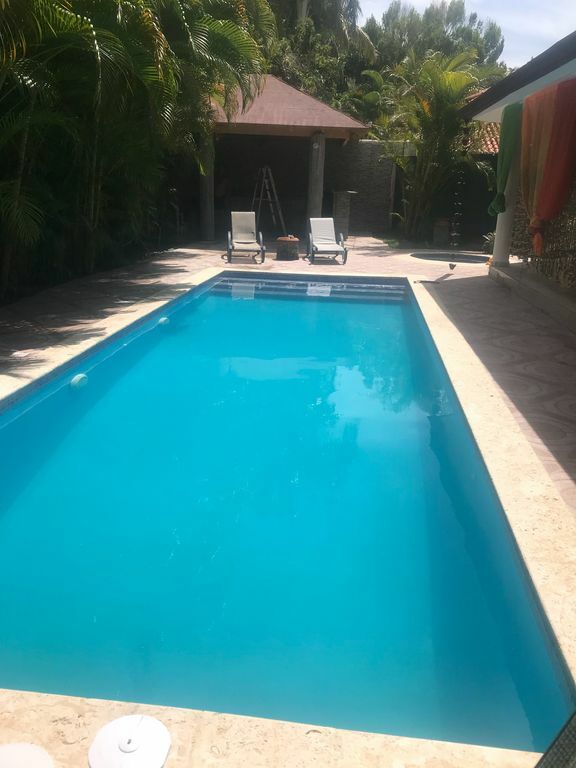 3 minute walk to semi-private beach playa laguna, 5 minutes drive from the lively public beach of Sosua with all kinds of beach activities and 10 minutes drive to Cabarete beach with its nightlife and kite surfing. The home is ideal for families, singles and groups wishing to experience the best of the Dominican Dominican coast has to offer. The AC are not included in the price. The house is located in the near coastal house is very friendly. Suitable for events and family vacations. 3 minutes walk to the private beach where you will enjoy the beautiful scenery. Amazing house with lovely charm. The home is very specious with vaulted ceilings and updated appliances. The airconditioner gets so cold you might need a blanket. Large Smart TV’s and modern baths. They are wonderful owners and will meet any of your needs. We ran out of propane while having a bbq and they had 3 tanks arrive at the house within minutes. The neighborhood is safe and secure. I would highly recommend. Hi! Very good guys! I will wait you next time!See you soon! Super class house with a Jacuzzi pool, next to the ocean! The house is huge with a magnificent terrace and very clean! Very sympathetic and friendly owner Marina! Excellent airport transfer from Marina. She also has a car for rent in excellent condition! Marina is a wonderful host.The house and the garden is beautiful .It is only steps away from the beach was a perfect location close to Sosua.The house was perfect for us.Thanks Marina and hope to be back soon. Hi, thanks for visit and for love in my house. I will wait you next time.